eCenter is a part of eWorkPlace. Which applications may be implemented as widgets? If you think that the development of widget is a wrong approach but you want show an icon for user then pay attention to SysTray widget. Use SysTray toolkit to add the icon the the tray. Disadvantages: user should install SysTray widget in advance. How to develop good widget for eCenter? Every widget should have icon on the left, text on the right (optional). So user can find the indicator without efforts. Setup dialog: Follow the recommendations how to create setup dialog: changes are applied immediately and on the fly. enable [x] button to accept the settings, don't use [Close] button in the bottom. 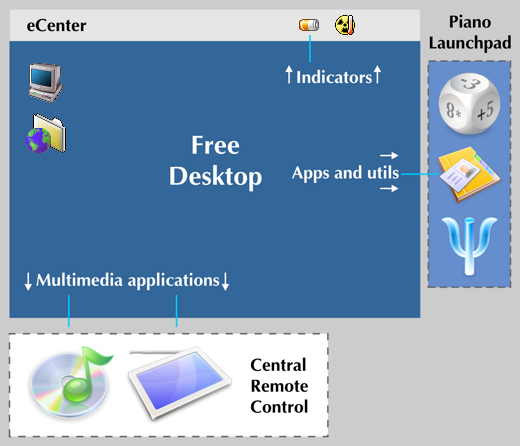 Left mouse button: open Popup menu with options related to the application. Right mouse button: opens Popup menu with eCenter properties.